This superb high quality 2-track hypnotherapy CD by Glenn Harrold combines powerful clinical hypnotherapy techniques with state of the art digital recording technology. This title is part of the highly successful "Diviniti Publishing Hypnosis" range, which has sold over 500,000 units and is now well established as the UK's best selling self help audio range.The two 30-minute tracks combine skilled hypnotherapy techniques with state of the art digital recording technology. Glenn's calming voice will guide you into a completely relaxed state of mind & body and help you to feel more energised and motivated. You will also hear hypnotic echoed background affirmations panning from left to right across the stereo range and subtle background sound effects recorded at certain frequencies and in specific keys to enhance the deep relaxation effect.In this very receptive relaxed state, you will be given a number of post hypnotic suggestions and carefully layered affirmations. This deeply relaxing method of delivering multiple suggestions simultaneously to the unconscious mind can facilitate positive changes very quickly.At the end of each track you will be gently brought back to full waking consciousness with a combination of suggestion and music. There are also a number of positive subliminal suggestions (listed in the booklet), which are embedded in the fade out music to facilitate the overall effect. 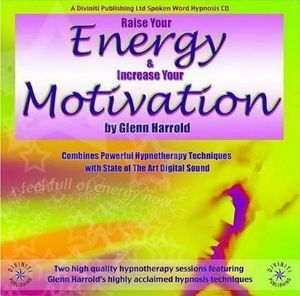 Overcome insecurity and build your self esteem with this superb high quality hypnosis CD by Glenn Harrold. Developing a positive outlook and strong inner self-beliefs will give you more self- confidence. Hypnotherapy is a uniquely effective way of programming the mind to overcome self-doubt and to raise self esteem. This hypnosis CD will help you achieve this aim in a safe and natural way, free of any harmful side effects. Both self esteem hypnotherapy sessions will guide you into a deeply relaxed trance state. Utilising skilled, clinical hypnotherapy techniques, you are given multiple layered post hypnotic suggestions and affirmations to develop powerful inner feelings of love and self respect. This will help you develop self esteem and help you to express your self more clearly and confidently. This hypnosis CD will help you to overcome insecurity and feel more confident and empowered. A pleasant voice guiding the listener into a completely relaxed state of mind & body. Hypnotic echoed background vocals panning from left to right across the stereo range - a deeply relaxing and uniquely hypnotic effect. 60 beats per minute digital sound effects & powerful subliminal suggestions - all compounding the overall effect. This powerful CD is a completely safe and very effective way of building your self-esteem. You will automatically feel more assertive and self-assured and you will develop an inner peace and self-esteem that will grow stronger.